Nancy Gahles, CEO and Founder of Health & Harmony Wellness Education and TeleHealth & Harmony, chiropractor, certified classical Homeopath and ordained interfaith minister has practiced in a family practice since 1979 specializing in integrative healthcare. She has practiced in the field of family medicine for 33 years and her approaches include a combination of natural herbs, yoga and meditation, structural correction, and nutrition in order to fight physical ailments. Dr. Nancy Gahles is an advocate for telehealth in integrative care. Dr. Gahles is past president of the National Center for Homeopathy, and is also on the experts panel at Mothering.com. She has been a frequent contributor of articles to many publications including the Journal fo the North American Society of Homeopaths, Homeopathy Today and the Digest of Chiropractic Economics. 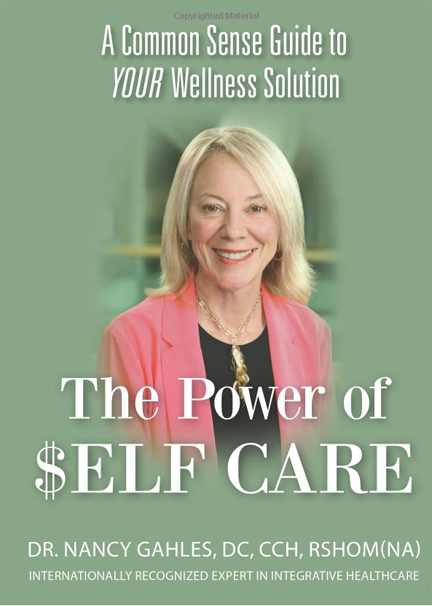 She recently presented at TedX – Umass on the topic of Health Portfolios, as described in her book, The Power of $ELF CARE. Dr. Gahles serves on the board of the Integrative Healthcare Policy Consortium as well as the advisory board for IntegrativePractitioner.com. She has been a strong voice for homeopathy and integrative care at the national legislative discussion level. Her ability to bring awareness, communicate clearly and build bridges continue to move toward broader inclusion of integrative wellness in the healthcare landscape. Health Inn will be talking about investing in YOUR HEALTH CARE PORTFOLIO. Our immense gratitude goes to Nancy for her community service and continued efforts to advocate for patient rights. Today, we call Nancy a "Thought Leader," even though she has worked in the field for over 30 years, to advance the concept of empowerment in consumer centric healthcare. Emphasis in her care paradigm is on the whole person, body, mind, emotion and spirit. She believes that creation of a wellness culture begins at home. Dr. Gahles educates the people with whom she consults to be aware consumers of health care and conscious co-creators of their own health and well being. A healthcare futurist, Dr. Gahles combines her talents and wisdom, to empower consumers to be disruptive innovators in their healthcare. You will want to ask your friends to join this live show on Monday, September 9th to learn what you can do for self care and self empowerment. In the process, you can save some money during financially rough times. Self-care, a principle that everyone can practice, is the source of acknowledging your own power. Dr. Gahles is an ardent patient advocate and works with each person to develop their best strategy for short and long term healthcare goals. As an advocate for health care choice and as a mediator between practitioner organizations, providers, credentialing and government agencies, she has a perspective on the future of medicine. We will need a new approach to incorporate alternative and integrative health care into modern medicine. The prevalent issue is portability of licenses across state lines. The dilemma exists when a patient/client is treated by a practitioner who is not located in the state they reside in. Should a complaint arise, which state medical licensing board should investigate? With the boom in remote patient monitoring, technology advancing at a rapid pace to provide real time, face-to-face consultations and a severe shortage in primary care physicians, the stage is set to maximize our doctor/client ratio using telehealth delivery systems. HHS’ Health Resources and Services Administration (HRSA) is working with the Federation of State Medical Boards to bring the administration’s guidelines into alignment with the needs of the healthcare industry to reach more patients with remote care delivery. Dr. Nancy Gahles is an advocate for Telehealth in integrative care. She is a Doctor of Chiropractic, Certified Classical Homeopath ( CCH), and Registered, Society of Homeopaths, North America ( RSHom, NA) who has been a modern leader in the national health policy dialogue as an advocate for integrative care and empowerment of wellness. In holistic family practice for over 33 years in the Belle Harbor and Queens areas of New York City, she combines herbs, nutrition, yoga and meditation along with structural correction for a variety of health issues. One factor that can make Obamacare significantly more acceptable to people is inclusion of alternative medicine and treatment, says author and alternative health advocate Alan Smith. WASHINGTON — The governor of Pennsylvania, Tom Corbett, released details on Friday of his proposal to use federal Medicaid funds to buy private health insurance for low-income people — a plan similar to one being carried out by Arkansas and considered by other Republican governors who oppose expanding Medicaid under President Obama’s health care law. Cost of Medication - New Hepatitis C Drug Gilead said the wholesale cost of Sovaldi, which is known generically as sofosbuvir, would be $28,000 for four weeks — or $1,000 per daily pill. That translates to $84,000 for the 12 weeks of treatment recommended for most patients, and $168,000 for the 24 weeks needed for a hard-to-treat strain of the virus. “This is unbearable to the health care system and it is completely unjustified,” said Michael Weinstein, president of the AIDS Healthcare Foundation, which runs treatment clinics in the United States and abroad and has previously clashed with Gilead on the price of its drugs for H.I.V. Wall Street Journal Article | Providing health-insurance benefits is key to employee retention, but rising costs can make this a challenge for small-business owners. Here are six options that may be able to help keep costs down. 1. A high-deductible health plan combined with a health savings account (HSA) 2. Purchasing cooperatives. 3. Company wellness programs. 4. Flexible-spending debit cards. 5. Disease management. 6. Nurse hot lines.